The stationary system for monitoring the parameters of vibration, mechanical quantities and/or other technological parameters of machinery. Systems are manufactured in accordance with the standards ISO10816-1-97, ISO10817-1-2002 and API Standard 670, oriented to European requirements for ergonomics and aesthetics. The system has a modular design. Depending on the technical tasks of monitoring and protection of the comprises control modules and protection logic modules, equipment for recording and visualization of data , switching equipment and equipment to ensure the smooth operation of the system. The system is scalable and can be gradually expanded from a single control unit, or even one of its node to monitor all critical equipment of enterprise. Reliability of the system is ensured by high reliability and unpretentiousness of components, differentiation of functionality, redundancy and self-diagnosis of the system state. The measuring channels are hardware-independent, i.e. The failure of one module does not limit the functionality of the whole group of channels. The system allows to carry out "hot plug" the faulty modules. Data backed up on an SD card control module and are not lost in case of temporary disconnection system computer. The power supply stability of the system is ensured by the duplication of secondary power supplies, the use of an uninterruptible power supply unit with an automatic reset device, and a device for protection from impulse noise. Backup data to SD card. 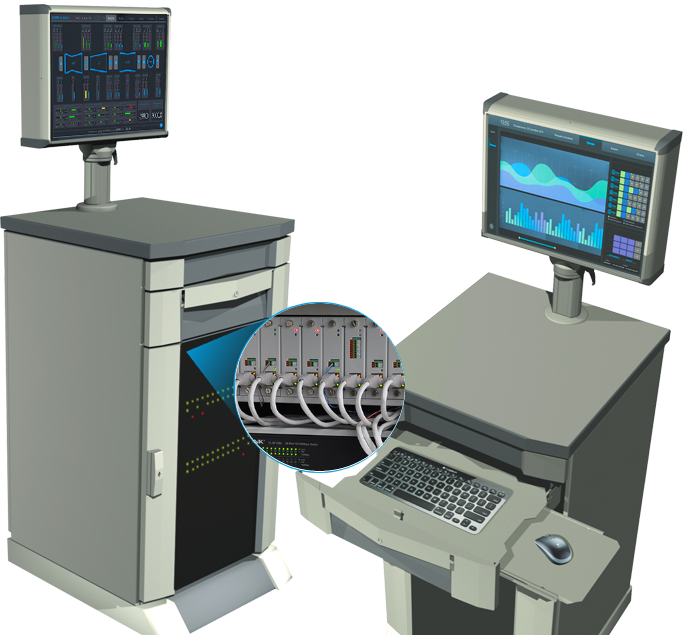 The workstation is equipped with software NORMA-VM SW1.0 for the general monitoring of the state of machinery or NORMA-VM SW2.0 for monitoring and diagnostics of the state of power equipment on sliding bearings. To perform testing and reconfiguration of modules. The NORMA-VM SW2.0 software package provides advanced visualization capabilities (mnemonic diagrams, tables, graphs) and a wide tool for analyzing vibration signals (statistics, spectral analysis, orbit analysis, transient analysis). The system provides several levels of access: operator / diagnostician / administrator, зwith password-protected. Authorized users can implement the ability to log in via the integrated web interface from anywhere in the world.